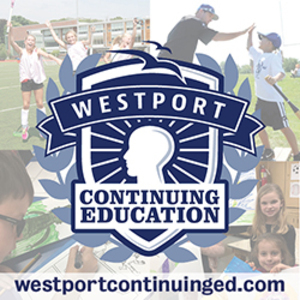 Westport Continuing Education is presenting a wide variety of April Vacation Camps for kids in grades K - 5 the week of April 15. Full and half day options are available for camps at Greens Farms Elementary School, 17 Morningside Drive South and Kempo Karate Academy at 374 Post Road, Westport. At Greens Farms Elementary School, choices include Game Time Academy, Bricks 4 Kidz®, or Mad Science. Energetic kids in grades K - 5 who love physical education will enjoy Game Time Academy with all of their favorite sports, fun, and games led by Physical Education teacher from Coleytown Elementary School, Chris Scholz. The nationally recognized Bricks 4 Kidz® program will present Jurassic Brick Land Camp for kids in grades K - 3, using specialized kits to build a LEGO® world that comes to life including a gentle Brontosaurus, ferocious Velociraptor, terrifying T. rex, and more. Learn about dinosaurs, “terrible lizards” and extinct animals that roamed the earth and swam the seas during the Jurassic period. Kids in grades 4 - 5 will discover how a doorbell works and more in the Snap to It: Circuits and Engineering Camp presented by an educator from Mad Science. Kids will build simple and complex electronic circuits (like a doorbell or a radio), experiment with electrons, and witness the hair-raising power of Mad Science’s giant Van de Graaff generator. Construct and create the code for programmable rovers and build your very own KIKO robot to take home! Options for all April Vacation Camps include full-day camps from 8:15am - 3:15pm, half-day mornings from 8:15am - 11:30am, or half-day afternoons from 12:00pm - 3:15pm. Fees for the four-day program at Greens Farms Elementary School are just $85 for a half-day session or $159 for all-day sessions that are offered from Monday, April 15 - Thursday, April 18. At the Kempo Academy, parents may choose single or multiple days with fees that start at $30 for a half-day session, per day, or $60 for a full day session, per day. For more information and to register, visit the Westport Continuing Education’s website at https://www.westportcontinuinged.com or call 203-341-1209.